Bisphosphonates (BPs) represent the elective therapy for several metabolic and oncological diseases affecting the skeletal system, such as different types of osteoporosis, Paget disease, osteogenesis imperfecta, fibrous dysplasia and primary or secondary bone cancer. Among nitrogen containing bisphosphonates, Alendronate (ALN) is mainly used for the prevention and treatment of osteoporosis (10mg once a day or 70mg once a week, per os administration). Conversely, Zoledronate (ZOL), one of the most potent nitrogen containing BPs, is usually intravenously injected in patients with advanced malignancies to prevent skeletal complications, such as pathological fractures, cancer-induced bone loss or hypercalcemia (posology: 4mg every 3 to 4 weeks), or in the treatment of osteoporosis (5mg once a year). Despite BPs' well-known therapeutic potential, they also present important side effects. In particular, prolonged treatment with these drugs seems to predispose to the development of paradoxical side effects affecting bone, such as osteonecrosis of the jaw (Bisphosphonate Related Osteonecrosis of the Jaw, BRONJ) and atypical femoral fractures (AFFs) [1, 2]. The pathophysiology of these skeletal conditions is still under investigation, as their etiology seems to depend on the synergy of several factors . For both side effects, drug-induced suppression of bone turnover, resulting in an impairment of bone quality and architecture, has been identified as the starting cause. For BRONJ, BP anti-angiogenic action, inflammation, genetic predisposition and altered immune status are recognized among the main causes and favoring factors . For AFFs, changes in mineral density and/or distribution, together with micro damage accumulation, are listed . Recently it has been estimated that the frequency of BRONJ onset in oncology patients receiving high doses of BPs spans from 1 to 15%, while in osteoporosis patient its prevalence is not enhanced (0.001%-0.01%). Indeed, Zoledronate infusion for the treatment of metastatic bone disease is frequently associated to BRONJ occurrence, whereas its administration in osteoporosis patients has been shown to substantially reduce fracture risk and increase mineral apposition rate [5, 6]. Up to now, no correlation between BP posology and AFFs has been described yet, but the direct relationship between duration of BP exposure and risk of developing this pathology is well documented . BPs, being synthetic analogues of inorganic pyrophosphate, can accumulate in bone tissue and be incorporated into bone-resorbing cells. Depending on their chemical structure, they act by inhibiting osteoclast-mediated bone resorption. Once internalized into osteoclasts, non-nitrogen containing BPs are metabolized to non hydrolyzable ATP analogs that interfere with energy metabolism, whereas nitrogen containing BPs affect mevalonate pathway by preventing the prenylation of small GTPase signaling proteins essential for osteoclast morphology and function . Beside this well documented anti-catabolic action on bone tissue, several in vitro evidences suggest that BPs may play a direct role in the process of bone formation as well. In detail, it has been demonstrated that BP exposure can enhance osteoblast differentiation, proliferation and activity [9-15]. In contrast, it has been suggested that µM or higher concentrations of BPs can inhibit osteoblastogenesis and induce osteoblast apoptosis [16-21]. The use of different experimental models and types of BPs, together with the employ of immortalized cell lines often of murine origin, might be responsible of these conflicting in vitro results on osteoblast metabolism. Therefore, we decided to investigate the effects of nitrogen containing BPs on human primary pre-osteoblasts. Herein, we show that high doses of both BPs exert a cytotoxic effect on osteoblastic cells, while lower doses affect the short-term release of several bone markers and cytokines. Moreover, we also provide evidence of a BP-dependent impairment of bone matrix production, suggesting an overall effect of these compounds on bone quality. Unless otherwise stated, chemicals and reagents were purchased from Sigma-Aldrich (St. Louis, MO, USA). Bone specimens were obtained from the femoral head of patients subject to total hip replacement surgery, following the procedure approved by IRCCS Istituto Ortopedico Galeazzi (PQ 7.5.125, version 4). For each patient, personal data (age and gender) and medical anamnesis were collected and donors with history of bisphosphonate therapy, both prior and at the time of surgery, were excluded. For pre-osteoblast isolation, trabecular bone was excised from the mid-deep area of the femoral head, selecting harvesting regions distal from the lesions, then minced into fragments with a scalpel and washed with PBS (Phosphate Buffered Saline) several times in order to remove residual adipose and/or hematopoietic tissue. Between washes, samples were vortexed at high speed to further promote the removal of debris and contaminant tissues. Bone chips were then placed, without any step of enzymatic digestion [22, 23], in 60mm petri dishes and cultured in high glucose DMEM supplemented with 10%FBS (Euroclone, Pero, Italy), 2mM L-glutamine, 50U/ml penicillin and 50μg/ml streptomycin at 37°C in a humidified atmosphere containing 5% CO2. Culture media were changed twice a week. When cells outgrown from the explants reached the 90% confluence, they were detached and sub-cultured every 2 weeks. For the experiments, pre-osteoblasts were employed within the 3rd culture passage. The phenotypic characterization of osteoblastic primary cultures is described in Supplementary material. 24 hours after seeding, pre-osteoblasts were exposed to several concentrations of the nitrogen containing BPs Alendronate (Y0001727) and Zoledronate (SML0223) dissolved in culture media. For each assay, control cells grown in the absence of the drugs were cultured in parallel. The wide BP concentration range chosen for the treatments was literature-based and derived from the lack of univocal ex vivo data on BP accumulation in bone. 3x103 cells/cm2 were seeded in triplicate on 96-well plates. At day 1, 2, 5 and 9 pre-osteoblasts were treated with a wide range of ALN or ZOL concentrations and cell viability was monitored through time as previously described . Briefly, at each time point (day 2, 5, 9 and 12) culture media were replaced with 200μl DMEM supplemented with 10%AlamarBlue® (Thermo Fisher Scientific, Waltham, MA, USA) and cells were incubated for 3.5 hours at 37°C in the dark. 100µl of supernatants were then transferred to black bottom 96-well plates and fluorescence (540nm excitation λ, 600nm emission λ) was read with Wallac Victor II plate reader (Perkin Elmer, Milan, Italy). 5x103 cells/cm2 were cultured in 24-wells plates in the presence or absence of BP concentrations spanning from 10-13 to 10-5M. After 14 days, cells were washed in PBS, lysed in 50µl 0.1%Triton X-100 and the protein content of each sample was quantified through BCA™ Protein Assay (Thermo Fisher Scientific, Waltham, MA, USA). Alkaline phosphatase enzymatic activity was assessed through a colorimetric assay based on the conversion of p-nitrophenyl phosphate (pNPP) into p-nitrophenol (pNP), following the procedure exhaustively described in . The enzymatic activity (U) was calculated considering the amount of produced pNP and the reaction time, then normalized to each sample protein content and expressed as ALP specific activity (U/µg). 5x103 cells/cm2 were cultured in 24-well plates either in standard conditions or in the presence of 10-13, 10-10 or 10-7M ALN or ZOL. After 16 days, the deposition of calcified extracellular matrix was quantified following standard procedures . Briefly,samples were fixed with 70% ethanol and stained with 40mM Alizarin Red-S. Specific staining was then extracted with 10% cetylpyridinium chloride in 0.1M phosphate buffer at pH 7.0 and absorbance was read 550nm with Wallac Victor II plate reader (Perkin Elmer, Milan, Italy). Cell pools were obtained from three primary populations mixed, at the same subculture passage, following a 1:1:1 ratio. We produced two cell pools with pre-osteoblasts deriving from heterogenous donors, one pool deriving solely from donors younger than 50 y/o and one from patients older than 60 y/o. Details of the pools are shown in Table 1. Pooled pre-osteoblasts were seeded at a density of 1.5x104/cm2 and treated with 10-13, 10-10 or 10-7M BPs for 7 days. Conditioned media were collected at day 3 and 7 after treatment, centrifuged at 2000g for 5 minutes, then stored at -20°C. The MILLIPLEX MAP Human Bone Magnetic Bead Panel-Bone Metabolism Multiplex Assay (HBNMAG-51K, Millipore, Burlington, MA, USA) was customized to contain 8 key bone molecules: DKK-1, IL-6, TNFα, OPG, OPN, SOST, IL-1β and FGF23. Duplicates of conditioned media (25µl/sample) were read through Bio-Plex Multiplex System (Bio-Rad, Milan, Italy) following standard procedures. IL-6 levels were measured in 1:5 diluted samples. Data analysis was performed with MAGPIX xPONENT 4.2 software (Luminex Corporation, Austin, TX, USA). Levels of secreted RANKL were determined by sandwich enzyme linked immunoassay (ELISA) on culture media in duplicate for each condition, following standard procedures (EK0842, Boster Bio, Pleasanton, CA, USA). Data were analysed with MyAssays software (www.myassays.com). Cells were lysed in 65mM Tris-HCl, 2% SDS at pH 6.8 supplemented with protease inhibitors. 20µg of whole cell extracts, quantified through BCA™ Protein Assay (Thermo Fisher Scientific, Waltham, MA, USA), were resolved in SDS-PAGE and transferred to nitrocellulose membranes (GE Healthcare, Milan, Italy). Membranes were probed with antibodies raised against type I Collagen (#7025, Chondrex, Redmond, WA, USA, dilution 1:5000), Osteopontin (ab8448,Abcam, Hongkong, China, dilution 1:1000) and SPARC (sc-33645, Santa Cruz Biotechnology,CA, USA, dilution 1:3000). β Tubulin expression was also revealed (sc-9104, Santa Cruz Biotechnology, CA, USA, dilution 1:1000). Proteins of interest were detected after incubation with appropriate HRP-conjugated secondary antibodies (Santa Cruz Biotechnology, CA, USA, dilution range 1:3000-1:5000) and revealed with LiteAblot® Turbo Extra-Sensitive Chemiluminescent Substrate (Euroclone, Pero, Italy). Images were acquired through ChemiDoc Imaging System™ and analysed through Image Lab™ software (Bio-Rad, Milan, Italy). Unless otherwise stated, data are expressed as mean ± standard error of the mean (SEM) of at least 3 independent experiments. Statistical analysis was performed by two-tailed unpaired Student´s t test using Prism 5 software (GraphPad Software Inc, La Jolla, CA, USA). Differences were considered significant at p≤0.05. Influence on cell viability of repeated treatments with ALN or ZOL concentrations from 10-15 to 10-5M. Data are represented as relative values setting as 100% the viability of untreated pre-osteoblasts at every time point (ctrl, blue dashed lines). Values are expressed as mean ± SEM of at least 3 independent experiments for each condition. Statistical significance versus ctrl is shown as *p<0.05 and **p<0.01. Cell viability was monitored for 12 days of chronic BP treatments (concentrations up to 10-5M). Concentrations below µM did not affect cell viability (Figure 1), while repeated treatments with 10-5M ALN slightly decreased it starting from day 5. At day 12, a significant reduction of -23.2 ± 8.2% in respect to untreated pre-osteoblasts was observed. Differently, ZOL administered at the same concentration exerted a stronger cytotoxic action compared to ALN. A significant reduction of cell viability was detectable starting from day 5 and at the final time point it reached a -68.7 ± 18.3% compared to control cells. Moreover, metabolic and apoptotic stress were perceivable already at day 2, when pre-osteoblasts acquired a rounder shape and increased vacuole secretion (data not shown). All subsequent experiments were performed using BP concentrations that did not significantly affect cell viability. We investigated the effect of repeated administrations of ALN or ZOL on alkaline phosphatase (ALP) activity and calcified ECM production, both well-recognized markers of osteoblast maturation. 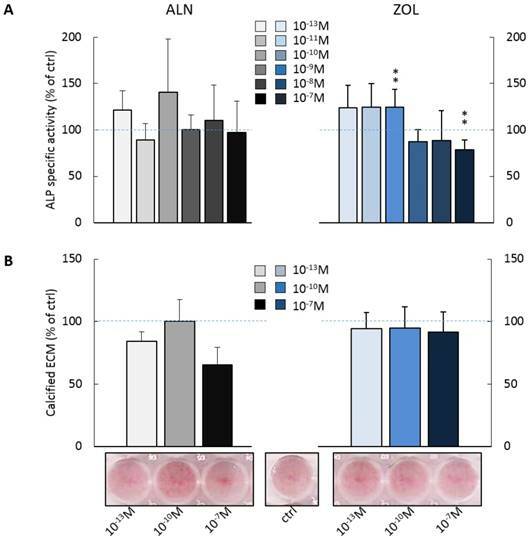 As shown in Figure 2A, pre-osteoblast response to ALN stimulus was extremely variable at day 14, whereas for ZOL a dose response trend was discernible. Indeed, ZOL≤10-10M enhanced ALP activity of about +25% in respect to untreated cells, while higher concentrations (ZOL≥10-9M) slightly decreased it (from -11% to -26%). As expected, µM concentrations of both compounds inhibited also ALP activity (data not shown). Conversely, ZOL slightly inhibited pre-osteoblast mineralization, while 10-13 and 10-7M ALN reduced it to a major extent (-15.7 ± 7.7% and -34.9 ± 14.3% in respect to control cells, Figure 2B). Cultured human primary pre-osteoblasts released detectable levels of IL-6, Osteopontin (OPN), Sclerostin (SOST), Dickkopf-related protein 1 (DKK-1), Osteoprotegerin (OPG), TNF-α, IL-1β and RANKL, while FGF-23 was undetectable (Table 2). Interestingly, the low basal levels of TNF-α were increased over time of about +94%. In addition, also the secretion of IL-1β was mildly upregulated, while the high levels of IL-6, OPN and SOST released up to day 3 seemed to be reduced at day 7. No variation was observed for DKK-1, OPG and RANKL, which maintained an average daily release of 548 pg/ml, 1.1 ng/ml and 73.8 pg/ml, respectively. Description of pre-osteoblast pools according to donor characteristics. OA: osteoarthritis. Effect on ALP activity and calcified ECM deposition of repeated treatments with ALN or ZOL concentrations from 10-13 to 10-7M. Data are represented as relative values setting as 100% the ALP activity (A) or the calcified ECM deposition (B) of untreated pre-osteoblasts (ctrl, blue dashed lines). Representative macrographs of Calcium nodules stained with Alizarin Red-S dye are shown. Results are expressed as mean ± SEM of at least 3 independent experiments for each condition. Statistical significance versus ctrl is shown as **p<0.01. Bone biomarkers and inflammatory cytokines released by cultured human primary pre-osteoblasts at day 3 and 7. Data are expressed as mean ± SD of 4 cell pools at day 3 and 3 pools (pool 2-4) at day 7 (n=12 and n=9 pre-osteoblast populations respectively). -: non detectable. At day 3, the highest doses of both ALN and ZOL down modulated OPN levels (Figure 3A). This mild reduction is maintained up today 7 just with 10-7M ZOL, whereas 10-7M ALN treatment slightly enhanced OPN. The secretion of SOST, DKK-1, TNFα and IL-1β seemed always slightly stimulated at day 3, although a second BP treatment almost normalized their levels to untreated cells, with only 10-7M ALN still stimulating TNFα release at the later time point (Figure 3D). At day 3, RANKL levels were slightly down modulated and a decreased RANKL/OPG ratio was revealed after 10-7M ALN, 10-13 and 10-10M ZOL treatment (Figure 3F). In addition, OPG and IL-6 levels were never affected by 7-day treatments (data not shown). In the attempt to disclose differences in OB response depending on donor characteristics, we analyzed our data considering donor age. For most factors, this novel analysis was irrelevant, except for IL-1β, whose release displayed an age-related trend in response to BP administration (Figure 4). 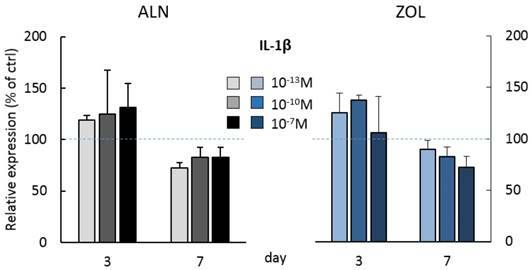 In fact, at day 3 all ALN concentrations stimulated pre-osteoblasts isolated from donors younger than 50 y/o to secrete IL-1β and a similar trend was observed after ZOL administration. On the contrary, cells harvested from older patients were not affected (data not shown). Unexpectedly, at day 7 both compounds reduced IL-1β release by cells derived from young donors (Figure 4), while cells harvested from elderly patients were either unaffected or slightly stimulated by the highest concentrations (data not shown). BP effect on protein secretion by pooled human primary pre-osteoblasts. OPN (A) SOST(B) DKK-1 (C) TNFα (D) IL-1β (E) RANKL and OPG (F) release was evaluated at both day 3 and 7 after ALN or ZOL treatment. Data are represented as relative values setting as 100% the secretion levels of the different analytes by untreated pre-osteoblasts (ctrl, blue dashed lines). Values are expressed as mean ± SEM of 4 (pool 1-4) and 3 (pool 2-4) independent experiments at each time point (n=12 and n=9 cell populations respectively). For each pool, donor characteristics are described in Table 1. Statistical significance versus ctrl is shown as *p<0.05. IL-1β secretion by pooled human primary pre-osteoblasts deriving from donors younger than 50 years old (pool 3, donor characteristics are described in Table 1). IL-1β secretion was evaluated at day 3 and 7 after treatment with ALN and ZOL. Data derive from 3 osteoblastic populations and are expressed as mean ± SD of technical replicates. 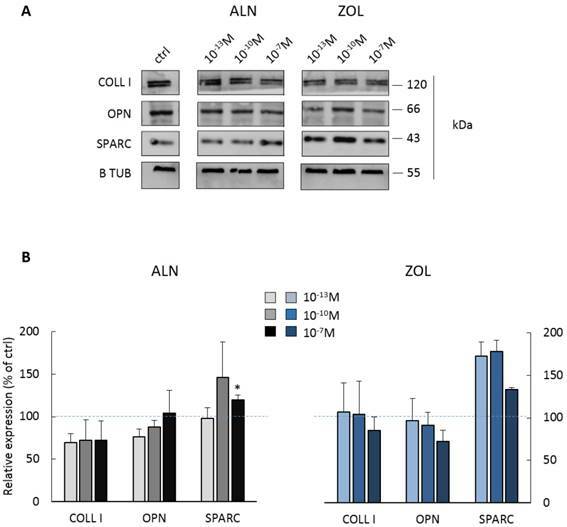 Most concentrations of ALN seemed to reduce both COLL I and OPN expression, whereas only the highest one significantly enhanced SPARC production (+19.6 ± 5.8% in respect to control cells). Differently, 10-7M ZOL seemed to reduce OPN and COLL I expression (mean decrease of -15 and -28%, respectively), but all doses favored SPARC increase (higher than +70% for 10-13 and 10-10M, around +34% for 10-7M). Protein expression by pooled primary human pre-osteoblasts after 7 days of BP treatment. (A) Representative blot with specific bands for COLL I, OPN, SPARC and β Tubulin expression. (B) Densitometric evaluation of the expression of ECM proteins by pre-osteoblasts. β Tubulin was used as internal control and each analyte was normalized on it. Data are expressed as relative values setting as 100% the expression of COLL I, OPN or SPARC by untreated pre-osteoblasts (ctrl, blue dashed lines). Results are represented as mean ± SEM of 3 independent experiments (pool 1, 2 and 4) and are obtained from 9 osteoblastic populations. For each pool, donor characteristics are described in Table 1. Statistical significance versus ctrl is shown as *p<0.05. Although it is widely accepted that the pharmacological mechanism of action of BPs mainly relies on the inhibition of osteoclasts, recent evidences suggest that they might directly interfere with osteoblasts, the anabolic counterpart of bone turnover. The process through which BPs are internalized by osteoclasts during the resorptive phase of bone remodeling cycle has been completely unravelled , whereas little is known about their incorporation mechanism into non-resorbing cells. In 2008 Coxon et al. were the first to describe the different responses to soluble or mineral-bound BPs by both resorbing and non-resorbing cells. The authors demonstrated that macrophages and osteoblasts grown in monocultures could internalize only limited amounts of drugs from the mineralized matrix. On the contrary, when cells were co-cultured with osteoclasts, the internalization rate was higher, indicating that the release of these molecules from the calcified matrix mediated by osteoclasts can affect neighboring targets . Here we show that high concentrations of both tested drugs strongly reduce pre-osteoblast viability. Moreover, also alkaline phosphatase activity is decreased by µM doses of BPs (data not show) and 10-7M ZOL, while low concentrations of ZOL slightly increased it. These data corroborate with the hypothesis of a dual nature of BP action on cells belonging to the osteoblastic lineage depending on dosage, recently resumed by Maruotti et al. : an inhibition at concentrations higher than µM and a stimulation at lower doses . However, the pro-osteoblastic/bone-sustaining effect by low BP doses described in literature [29, 30], that we observed on ALP activity, in our experimental set up is disproved by analyzing a more mature marker of osteogenesis, the mineralization capacity. Indeed, we gave evidence of an inhibitory trend affecting pre-osteoblast mineralization potential following treatments with both drugs, with ALN exerting a stronger effect. Since in our hands BPs directly affect metabolism and function of bone-forming cells, we investigated their influence on the release of soluble mediators involved in cell-cell crosstalk within bone milieu. In order to minimize the donor-related variability, we applied a cell pooling strategy, an approach quite convenient when working with human primary populations [31, 32]. We are aware that despite this set up allowing reduced variability both within and between experiments, its major disadvantage, beside a diminished statistical power, is the loss of information on the behavior of each individual population . In any case, we believe that data obtained following this approach minimize the impact on the cumulative result of any eventual experimental serendipity or bias. We gave evidence of a short-term pro-inflammatory and an anti-osteoanabolic effect of ALN and ZOL treatment. In detail, after a single administration of both BPs we observed a positive trend in the secretion of TNFα and IL-1β, classically known to inhibit osteoblast differentiation and stimulate bone resorption [34, 35]. This pro-inflammatory phenotype within the bone microenvironment can be interpreted as a positive stimulus to early phase osteogenesis, as in physiological conditions bone regeneration and healing are triggered by the onset of an injury-derived inflammatory reaction [36, 37]. In this perspective, the enhanced early secretion of IL-1β by cells deriving from young patients could fit the physio-pathological context of BP-related skeletal side effects. Indeed, it is well documented that age represents one of the major risk factors associated to BRONJ onset . Our data agree with previous in vitro  and ex vivo [40, 41] studies that described a correlation between inflammation and nitrogen containing BPs. Here we are the first to show a direct pro-inflammatory action on pre-osteoblasts, since previously it was investigated on immune cells, mainly macrophages [39, 42, 43]. Furthermore, BPs increased the early release of SOST and DKK-1, known inhibitors of osteoblastogenesis acting on Wnt/β catenin pathway . Interestingly, RANKL/OPG ratio was slightly down modulated by the rapid BP treatment, in contrast to OPG and RANKL levels that were not significantly affected (data not shown). As RANKL promotes osteoclast differentiation and OPG being its decoy receptor, their decreased ratio suggests an inhibitory influence on osteoclastogenesis and osteoclast differentiation. Conversely, in agreement with the hypothesis of a BP-dependent anti-anabolic effect on bone, in treated cells the early secretion of Osteopontin was reduced and a modulation of several intracellular ECM proteins was observed. 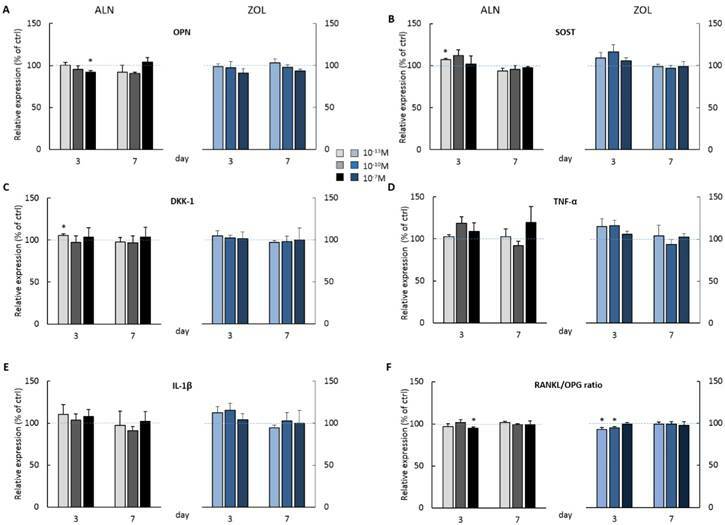 Indeed, both ALN and 10-7M ZOL slightly inhibited type I Collagen and Osteopontin expression, whereas the production of SPARC seemed to be enhanced, suggesting a drug-dependent modification affecting the quality of the osteoid. In contrast to our results on cell viability and ALP activity, the more potent influence by ALN on the release and/or production of COLL I and OPN raises additional questions on BP mechanism of action. Beside a diverse internalization rate, we suggest that these compounds might interfere on distinct molecular pathways and this aspect will require further investigations. With the perspective of unraveling a direct BP effect on OBs that may explain BRONJ onset, Manzano-Moreno et al. performed short ALN and ZOL treatments on human primary osteoblasts and MG-63 osteosarcoma cell line to evaluate the gene expression of several osteoblast biomarkers . They showed an inhibition of type I Collagen and ALP that partly agrees with our results. Indeed, they found that 10-7M ALN is more potent than ZOL in downregulating COLL I mRNA levels. Moreover, a decreased ALP gene expression in agreement with our reduced activity was observed with µM BP concentrations. Finally, also the lack of modulation of OPG by low BP doses collimates with our data on protein release. Interestingly, they described an increase of OPG mRNA levels in treated MG-63 cells that highlights the possibility of inconsistent results among primary cells and cell lines. Taken together, our data show that low BP doses act directly on bone-forming cells by increasing the expression of negative bone mediators and impairing ECM quality, suggesting an overall anti-anabolic effect on bone milieu. We believe that the unbalance of bone microarchitecture and cell-cell crosstalk might be related to the development of the drug-related side effects often described at the skeletal level. Based on our in vitro results, we hypothesize that BPs may exert an anti-anabolic action within bone microenvironment that could be partially involved in the development of side effects affecting the skeletal system, such as BRONJ or AFFs. We would like to propose that, when osteoblasts are exposed to BPs in pre-pathological conditions, their rapid response may determine an unbalance of the remodelling cycle that, in synergy with other predisposing factors (e.g. bone microdamage, inflammation) and drug-dependent effects (e.g. soft tissue toxicity, inhibition of angiogenesis), may concur to the pathology onset. ALN: Alendronate; AFF(s): atypical femoral fracture(s); BP(s): Bisphosphonate(s); BRONJ: Bisphosphonate-Related Osteonecrosis of the Jaw; COLL I: Type I Collagen; DKK-1: Dickkopf-related protein 1; DT: Doubling time; ECM: Extracellular matrix; IL-1β: Interleukin 1β; IL-6: Interleukin 6; OA: Osteoarthritis; OB(s): Pre-osteoblast(s); OC: Osteocalcin; OPG: Osteoprotegerin; OPN: Osteopontin; PBS: Phosphate Buffered Saline; SOST: Sclerostin; SPARC: Osteonectin; TNFα: Tumor Necrosis Factor α; ZOL: Zoledronate. This study was supported by IRCCS Istituto Ortopedico Galeazzi (RC L2033) and Department of Biomedical Surgical and Dental Sciences, University of Milan (14-2-3017000-511). Corresponding author: Anna Teresa Brini, Department of Biomedical, Surgical and Dental Sciences, University of Milan, via Vanvitelli 32, 20129 Milan, Italy. Tel: +39-02-50316988; Fax: +39-02-50316987; E-mail: anna.briniit.